A hazardous area is an area (indoors or outdoors) that contains or may contain flammable substances. The flammable substance may be a liquid, gas, vapour or dust. The area may contain a flammable substance all of the time, most of the time, or only in specific situations, such as during shutdowns or accidents. In such a hazardous area, an explosion or fire is possible if all three conditions of the Explosion Triangle are met. These three conditions are fuel (a flammable substance), a source of ignition (or heat) and oxygen (air). The situation is often presented as a triangle, hence the term Explosion Triangle. Often, eliminating the flammable substance is not possible, and therefore the oxygen (air) or source of ignition has to be eliminated. Keeping in mind the Explosion Triangle, we can conclude that one or more of the three elements must be eliminated. Many times, eliminating the flammable substance is not possible, and therefore the oxygen (air) or source of ignition has to be eliminated. However, it is also often impossible to eliminate the air. Therefore, the most practical solution is to eliminate the source of ignition, spark or heat. In the case of electrical calibration equipment, it can be specially designed to use in hazardous areas. There are many ways to design electrical equipment suitable for hazardous areas. Calibration equipment is often designed in such a way that it cannot provide enough energy to cause the source of ignition, spark or heat. Some of the first hazardous areas were discovered in the early coal mines. Being flammable substances, both the coal dust and the methane absorbed created a hazardous area. The lighting in early mines was produced by candles and torches, generating a source of ignition. This led to many accidents. Later, when miners began to use electrical equipment (lighting, tools), many accidents occurred due to sparking or heating. Eventually, design standards were developed to guide the design process to prevent the sparking and heating of electrical equipment. This was the first intrinsically safe electrical equipment and it led the way to the standards compiled for equipment used in hazardous areas today. There are many industries that have hazardous areas. Some plants have large hazardous areas, while others have only small sections classified as hazardous areas. Typical industries with hazardous areas include chemical and petrochemical industries, offshore and onshore oil and gas, oil refining, the pharmaceutical industry, food and beverage, energy production, paint shops and mining. Since a flammable substance may be a liquid, gas, vapour or dust, there are surprisingly many different industries that may have some areas where these substances may be present during the normal operation or during shutdown. Even some seemingly safe industries may have hazardous areas. In plants, all areas classified as hazardous should be clearly marked with the Ex logo. There is often discussion about flammable and combustible liquids. But what are they precisely? Generally speaking, they are liquids that can burn. They may be gasoline, diesel fuel, many solvents, cleaners, paints, chemicals, etc. Some of these liquids are present in many workplaces. Flashpoint and auto-ignition temperatures are also often discussed. Flashpoint is the lowest temperature of a liquid at which it produces sufficient vapour to form an ignitable mixture with air. With a spark or enough heat, it will ignite. Auto-ignition temperature is the lowest temperature at which a liquid will ignite even without an external source of ignition. Most commonly, flammable and combustible liquids have auto-ignition temperatures in the range of 300 to 550°C. However, there are liquids that have an auto-ignition temperature as low as 200°C or even less. Based on their flashpoint, liquids are classified as flammable or combustible. Flammable liquids may ignite at normal working temperatures, while combustible liquids burn at higher temperatures. Often 37.8°C is considered the temperature limit. Flammable liquids have a flashpoint below 137.8°C and combustible liquids above. To be more precise, flammable and combustible liquids themselves do not burn, it is the vapours that burn. More precisely, it is the mixture of the vapours and air that burns. There are also limits of the concentration within which they can burn. If the concentration of the mixture is too low (too thin) it will not burn; the same is true if the concentration is too high (too rich). The limits are known as lower and upper explosive limits (LEL and UEL). It is good to remember that some liquids may have a rather low flashpoint. For example, gasoline has a flashpoint as low as -40°C. It produces enough vapours in normal environmental conditions to make a burnable mixture with air. Combustible liquids have a flashpoint way above normal environmental conditions, and therefore they have to be heated before they will ignite. As mentioned earlier, in order to prevent an explosion, one of the three elements of the Explosion Triangle should be eliminated. In practice, eliminating the source of ignition would be the most sensible. There are various techniques in electrical equipment that make them safer for hazardous areas. These different techniques fall into two main categories: eliminate the source of ignition (Exe, Exi) or isolate the source of ignition (Exd, Exp, Exq, Exo, Exm). The Exi intrinsically safe technique is the most commonly used and most suitable protective technique for electrical calibration equipment. Intrinsically safe equipment is designed for any situation; it will not provide enough energy to generate sparks and excessively high surface temperatures, even in the case of a faulty device. The equipment is designed to be intrinsically safe. Inside an Exi device, the Encapsulated (Exm) technique may also be used for certain parts of the equipment, as in a battery pack. Using non-Ex calibration equipment in a hazardous area may be possible, but it requires special approval from the safety personnel in the factory. Often this also involves the use of safety devices such as personal portable gas detectors, to be carried in the field while working. Using equipment correctly rated Ex is easier, as it does not require any special approvals. Naturally, the Ex-rated calibration equipment must be suitable for the hazardous area to which it is taken. There are two different standardisations specifying hazardous areas and classification of the equipment used in hazardous areas. One is the International IEC standard and the ATEX directive used in international and European legislation. The second is the North American legislation. The international standard family of IEC 60079 defines the different standards for related regulations. The IECEx scheme involves international co-operation based on the IEC standards. The objective of the IECEx system is to facilitate international trade in equipment and services for use in explosive atmospheres, while maintaining the required level of safety. Today, there are approximately 30 member countries in the IECEx, including the USA. 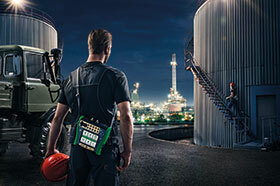 The ATEX directive was introduced to unify hazardous equipment and work environments within the European Union. It was established about ten years ago and is based on the directives introduced in the ‘90s. In ATEX-directive Group II, equipment is divided into product categories specifying the use of the equipment in different zones. • Product category 1: Very high safety level. Can be used in Zone 0 and Zone 1 and 2. • Product category 2: Can be used in Zone 1 and 2 but not in Zone 0. • Product category 3: Normal safety level. Can be used in Zone 2 but not in Zones 0 and 1. In the IEC standards, the same thing is expressed using Equipment Protection Levels (EPLs). EPLs are specified using nearly the same categories. EPL a: Very high safety level. Can be used even in Zone 0 and Zone 1 and 2. EPL b: High safety level. Can be used in Zone 1 and 2 but not in Zone 0. The zone classification specifies how likely it is for a certain flammable substance to occur in the atmosphere in a certain area. Electrical equipment in Group I is intended for use in mines susceptible to firedamp. • IIA: a typical gas is propane. • IIB: a typical gas is ethylene. • IIC: a typical gas is hydrogen. This subdivision is based on the maximum experimental safe gap (MESG) or the minimum ignition current (MIC) ratio of the explosive gas atmosphere in which the equipment may be installed. Equipment marked IIB is suitable for applications requiring Group IIA equipment. Similarly, equipment marked IIC is suitable for applications requiring Group IIA or Group IIB equipment. Equipment marked IIIB is suitable for appli-cations requiring Group IIIA equipment. Similarly, equipment marked IIIC is suitable for applications requiring Group IIIA or Group IIIB equipment. The temperature class specifies the maximum surface temperature in the equipment. The temperature class is important to take into account and ensure that it matches with the flammable gas that may be present in the plant’s own hazardous area. 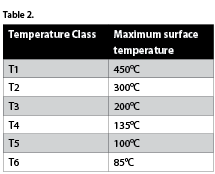 The temperature classes and temperatures are shown in Table 2. Some equipment may also have a maximum surface temperature specified as a certain temperature being in between the classes. Depending on the type of flammable substance in a certain area, the flashpoint and auto-ignition temperatures will be different. The equipment selected to be used in that hazardous area must have a temperature classification that suits the substances in question. The temperature class of a device is included in its marking, for example T4. Finally, it is important to ensure that the equipment is suitable for the environmental conditions where it will be used. For example, the safe operating temperature of the device must match the temperature in which the equipment is used in a plant. In wet and dusty conditions, the protection rating of the equipment casing needs to be considered; this can be classified Ingress Protection (IP) or NEMA. Different protective techniques may require different classification on the casing. It is also important to remember that the casing of some Ex equipment is made out of non-static semi-conducting material to avoid accumulation of any static electricity.